Ya Ali Madad. On the occasion of Idd-e-Navroz please accept our heartfelt felicitations! May Mowla grant peace, prosperity, happiness, barakat, higher spiritual enlightenment, spiritual & luminous tayid (help) and empowerment to you, your family, your Jamat and the worldwide Jamat in the New Year. Ameen. The Ismaili Muslim Tariqah is an esoteric Tariqah and culminates in mystical dimensions for those who conduct a personal search under the supervision of Noor Mowlana Shah Karim Al-Hussaini Hazar Imam (a.s.). These are difficult matters because we hope to go beyond this material world of cause and effect, and into the world of Soul and Light. The challenge is to first start reflecting deeply on mystical experiences so that we can understand the position of our True Imam. This will lay a firm foundation for our personal search for higher spiritual enlightenment. Then, we can start or continue with our personal search. In this post, I will be presenting: (1) key concepts of mysticism (Sufism); (2) a summary of historical events regarding the luminous links between the Holy Prophet Muhammad (s.a.s) and Mowlana Murtaza Ali (a.s.); and (3) a luminous dhikr, Noore_Karim_Hazar_Imam, which describes the position of our Holy Imam. Download Noore_Karim Hazar_Imam sound track in wma format. Lyrics for the above sound track are presented in Part 7.
" It is certainly true to say that the Western World doesn?t necessarily understand the theology of Shi?ism nor indeed the theology of many mystical sects whether they are Shia or Sunni or Christian. Mysticism, in its, in its essence is difficult." The quotation leads to the question, what is mysticism? Let us explore this concept further. "Scholars who focused on understanding the objects of faith became differentiated into several schools of thought. The dogmatic theologians (the authorities in kal?m) said that the best way to understand God is by rational interpretation of the Koran. The philosophers (fal?sifa) held that human reason is a sufficient guide to the truth of things and that divine revelation may not be indispensable for understanding that truth. The Sufis maintained that the best and most reliable path to correct understanding was by direct communion with God. Scholars associated with Sufism developed a distinctive methodology. With good reason, their approach has often been called "mystical." Webster's second definition of mysticism tells us that it can mean "the doctrine or belief that direct knowledge of God, of spiritual truth, or ultimate reality. . . is attainable through immediate intuition, insight, or illumination and in a way differing from ordinary sense perception or ratiocination." This doctrine is certainly characteristic of the Sufi approach to understanding God and the world. However, they held that this direct knowledge ?which they typically called "unveiling" (kashf)?must be rooted in the Koran and the Sunnah of Muhammad. Many of them also had a good deal of respect for the various rational approaches to knowledge. They maintained, however, that despite the opinions of the philosophers, reason alone is not sufficient to attain knowledge of God, and despite the opinions of the theologians, a merely rational understanding of the Koran is also inadequate. " From the above, it is clear that there are three methods of learning: (1) rational interpretation; (2) philosophical understanding; and (3) direct communion with higher realities. Let us put all this in context through an example. We first learned the Arabic text of our Holy Dua. Then, we learned the meaning of the words and sentences and were taught the philosophy of our Holy Dua by a large number of learned wazeins. They explained to us the relationships between Allah, the Light of the Holy Prophet Muhammad (s.a.s. ), the Light of the Holy Qur'an, the Light of Mowlana Murtaza Ali (a.s.), the Noor of Imamat and the Noor of Mowlana Hazar Imam. This conceptual knowledge is important, but it not comparable to the actual experience of seeing the Light during the recitation of the Holy Dua. That experience would be a Didar in itself. The didar of Light is called 'unveiling' or 'kashf'. Is this concept presented in our Tariqah? The answer is yes ... please read on! O my Lord! Open the curtain and look at me face to face. O my Lord! Pir Shams is thirsty for (the vision of) your face. of Your mysteries and secrets. In his Usul-e-Din firman made in Dar es Salaam on September 29, 1899, Noor Mowlana Sultan Muhammad Shah (a.s.) has described Pir Shams as the one who followed the faith steadfastedly to achieve an exalted destiny. Mowla has described Pir Shams as the one who was passionately in love of the Spirit which enabled him to reach the sacred sanctuary. The Pir's path was focused on the Haqqiqat and through it, he experienced the Marifat. He was blessed with the ultimate didar i.e., the vision of the Imam's holy countenance. Also, please study verse 9 of this ginan. In the final stages of the spiritual journey, the intellect is overwhelmed by the experiences of unveiling or kashf. This means that the reason cannot comprehend the experiences of unveiling or kashf. When our Holy Prophet (s.a.s.) was 43 years old, he had a meeting with the dignitaries of his family in which he asked who among them would support him in the divine mission and shoulder the task so that he may be his Brother, his Lieutenant, the Executor of his will and his Vicegerent and his Successor in the office after him. Mowlana Murtaza Ali (a.s.) who was only 13 years of age, was the only person who give an affirmative answer to the Holy Prophet (s.a.s). The following excerpt is from footnote 41 which appears on page 88 of 'The Holy Qur'an' by S.V. Mir Ahmed Ali. 1995. Second edition. Tahrike Tarsile Qur'an Inc., Elmhurst, New York. Ali being entrusted with the responsibility of returning the trusts to the respective owners on behalf of the Holy Prophet. The declaration of Ali's relationship to the Holy Prophet being the same as that of Aaron and Moses. The declaration of Ali being the next to the Holy Prophet as the witness to the truth. Allowing Ali's door to be kept open in the Holy Mosque with that of the Holy Prophet while all those of the others were ordered to be closed. Ali being the taken as the Soul of the Holy Prophet and Ali's sons (Hasan and Husain) as the sons of the Holy Prophet on the occasion of the historic 'Mubahila' with the Christian of Najran. Ali being the second referred to in verse of 'Tat-heer' and his wife (Lady Fatima) and his children being the others along with the Holy Prophet, implied in the verse. Ali being declared as having the same mastery and authority on the faithful ones as has God and His Apostle (the Holy Prophet). Ali being declared as the Gate (the entrance and exit) of the City of Knowledge (the Holy Prophet). Ali and the chosen ones of his issues being declared the heirs or inheritors of the Divine Book, the Holy Qur'an. Ali being declared to be always with the Holy Qur'an and the Holy Qur'an to be always with Ali. Ali being declared to be always with the truth and the truth to be always with Ali. Ali's deputation as the only rightful person to represent the Messenger of God (the Holy Prophet) to convey the first verses of the Chapter 'Bar'at' (which marks uncompromising demarcation between Islam and infidelity), and the Holy Prophet on this occasion saying that none has the right to convey the Divine message save myself or Ali who is mine and I am his. The same closest union of Ali and the Holy Prophet was declared saying, "I and Ali originated of the one and the same Divine Light." In the same way as Abraham and Ishmael who never bowed before any idol, were ordered by God to clean His House (the Kaa'ba) for the use of the pious...the Holy Prophet and Ali who were also Divinely purified and commissioned to the task of cleaning the same House of God of the idols for the second time." The following excerpt is from footnote 41 which appears on page 89 of 'The Holy Qur'an' by S.V. Mir Ahmed Ali. 1995. Second edition. Tahrike Tarsile Qur'an Inc., Elmhurst, New York. Let us perform the luminous dhikr of Noore_Karim Hazar_Imam with utmost humility and tenderness of the heart (length 4 min 41 sec; 6.5 MB). Our Holy Imam is intensely involved in creating a better quality of life for millions of people around the world. He also has spiritual (ruhani) and luminous (noorani) dimensions. In this article, we have attempted to understand the luminous (noorani) position of our True Imam. It is important to think about this dimension in order to prepare for or continue a personal search. This is also the best time to embark on such a mission because we will be blessed with a zaheri (outward) noorani didar during his visit (whenever it takes place), and a batuni (inward) noorani didar in our prayers and bandagi. 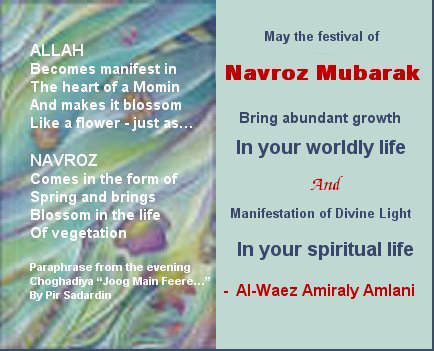 May the barakat of the auspicious occasion of Idd-e-Navroz bring us material, spiritual and luminous blessings! Ameen.